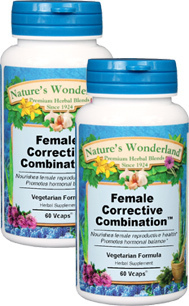 Female Corrective Combination™ - 500 mg, 60 Vcaps™ each (Nature's Wonderland) - Penn Herb Co. Ltd. Female Corrective Combination™ promotes gentle hormone balance and helps to tone & strengthen the female reproductive system. Be among the thousands of satisfied women who have noticed a difference! Blessed Thistle, Cayenne Pepper, Cramp Bark, False Unicorn Root, Ginger Root, Golden Seal Root, Red Raspberry Leaves, Squaw Vine, Uva Ursi Leaves. OTHER INGREDIENTS: Plant Cellulose (Vcaps™) - vegetarian capsules. Balances, tones & strengthens the female reproductive system; nourishes (ovaries, uterus, fallopian tubes); promotes hormone balance. As an addition to the daily diet, take 1 or 2 capsules three times daily with water at mealtimes. NOT TO BE USED DURING PREGNANCY.